For those who are just starting to have an interest in traditional Korean music, it’s not uncommon to confuse the sound of ajaeng with that of haegeum because these two are string instruments that make sounds by bowing. However, the ajaeng and haegeum are totally different musical instruments in shape. As we learned in the previous edition, haegeum is a very compact and light musical instrument that can be played while horse-riding. The bow is also made by fixing horsehair to a bamboo shoot. But the ajaeng, at a quick glance, looks similar to the geomungo. The wood bridges called anjok, the webfoot-shaped wood piece, are placed on top of the soundbox of the ajaeng made of paulownia wood. And intertwined silk threads are fixed on top. The size of the traditional musical instrument is even larger than gayageum or geomungo. 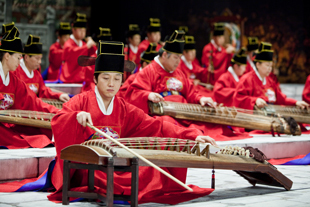 Therefore, it produces the lowest notes among all traditional Korean musical instruments. An interesting feature is that the bow is made of forsythia wood. Why don’t we listen to an ajaeng piece? 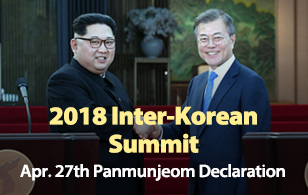 You just listened to a piece called “Sujecheon.” It is a court music composition that was performed at banquets held in the palaces in the past. Although its slow in tempo, you must have noticed the incomparable elegant melody. It is known that the ajaeng originated in China was first introduced during the Goryeo Kingdom. That’s why in the beginning the zither was only used for playing music from China. However, gradually, the use of it became widespread and ajaeng is now always featured at large-scale ensembles. Around the 1950s, a unique music genre called “gukgeuk” was popular among the public. It was kind of a musical play that is centered on tunes of the narrative singing pansori or music of the southern region. The retooled musical instrument that is played for folk songs or gukgeuk, is sanjo-ajaeng which is commonly played these days. The size of sanjo ajaeng has been reduced to nearly half that of the original one. The space between the strings became narrower, accordingly to the smaller ajaeng with its slimmer width. What’s more, instead of the bow made with forsythia wood, a bow with horsehair strings used for the cello or violin is used to play much softer and fast-tempo music. The thinner strings can add diversity to the tune. With a wide variety of sounds, the musical instrument can better tug at listeners’ heartstrings. Let’s listen to another ajaeng piece. As you just heard, an ajaeng with its lower sounds can be played to support the melodies of other musical instruments. But when performed solo, the rough sound of the ajaeng can draw out the deepest feelings of sadness hidden at the bottom of one’s heart. During Joseon era, there was a noble scholar called Kim Un-ran. He lost is eyesight at a tender age after suffering from an eye disease. At the time, a lot of blind people usually made their living by engaging in fortune-telling. The profession was considered a job for the lower class back then. You can imagine how those resigned to such a fate bore deep resentment. Kim learned the ajaeng to relieve the deep sorrow in his heart. One day, Kim played ajaeng as he was seated near a wall of an old ancestral shrine. As expected, the tune was very rueful. But suddenly he could hear the sound of crying from the inside of the shrine. It is said that the spirits enshrined in the structure were awoken by Kim’s ajaeng music. As soon as he heard the eerie noise, Kim ran away with his ajaeng. Our listeners must be curious about the doleful sound that could even awake the dead souls. These days, you can easily find creative music that features the ajaeng. Also new attempts are being made to express brighter sounds with the traditional musical instrument. This poem by Yulgok, one of the most renowned Joseon scholars, was improvised after lending his ears to an ajaeng piece performed by Kim Un-ran. So, how did you like today’s ajaeng pieces? Next time we’ll be back with piri stories.